In many countries, people with disability have the provision of receiving a disability allowance to run their lives. A host of private and government bodies are involved in running this endeavor for the benefit of people with special needs. In order to be considered for Disability Forms allowance, an applicant is required to furnish his or her accurate details in an allowance form. Below we brief about the popular disability forms. 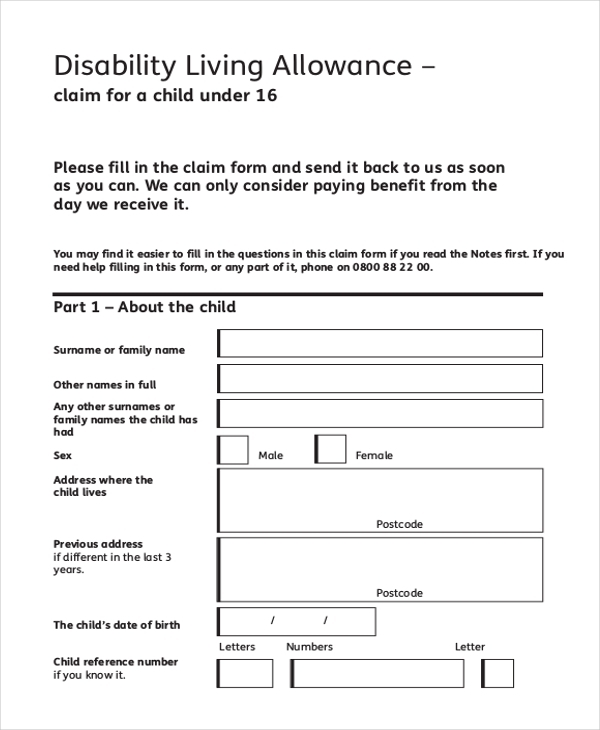 A disability living allowance application form is to be used by disabled persons who wish to receive tax-free social allowance benefits on the account of disability. Be it a child or an adult, both qualify to receive benefits of this scheme. In the case of a child, he or she must be 16 years at least. 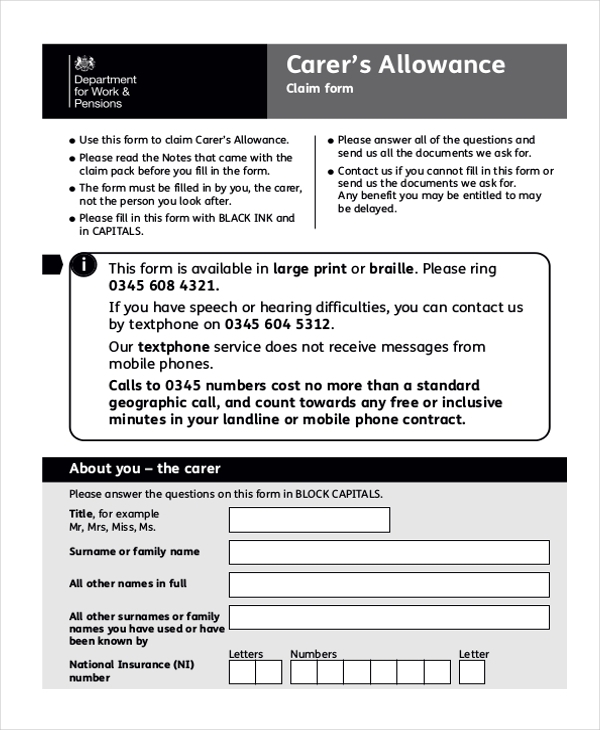 A disability carer’s allowance application to be filled by an individual who seeks care allowance for administering care services to people with special needs. When filing this form, it is mandatory that the carer also fills the details of the benefactor receiving the care service as he or she also needs to be aware that the carer is making an allowance claim on their behalf. In case a student is suffering from a disability of some kind and needs an allowance for their needs, an applicant needs to furnish accurate details about themselves as well about their disability. 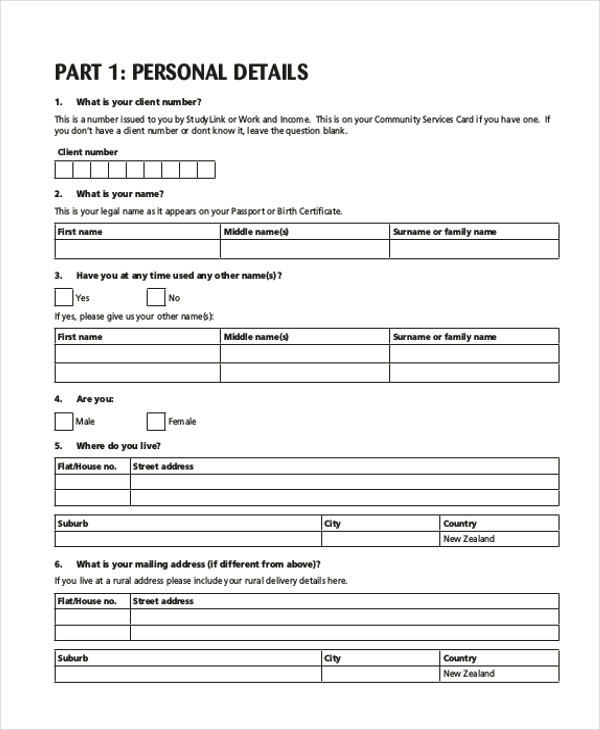 An applicant cannot submit this form without documentary evidence about their disability as well he or she also needs to supplement the form with evidence of previous disability which they may have received. 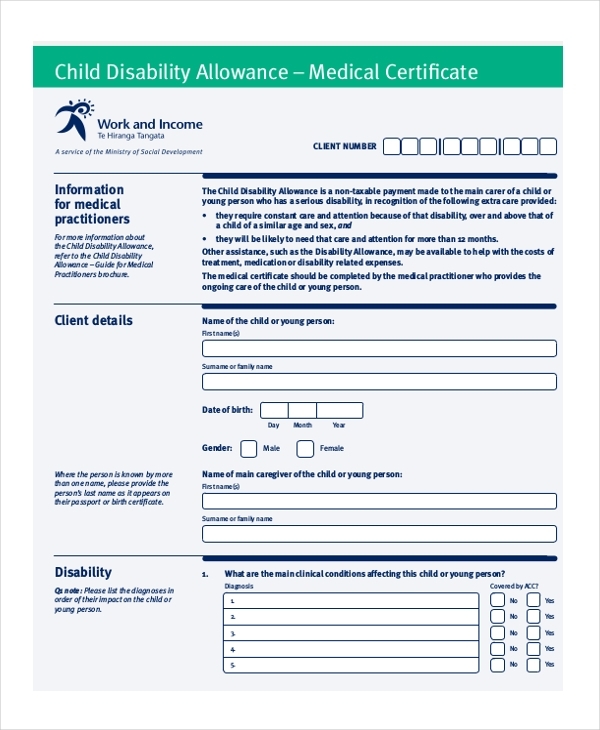 The child disability allowance application form is handy for those carers who are involved in administering care to children or youngsters with severe disability. The allowance is a non-taxable payment which is allocated to the main carer for the services they render towards the cause of the child or youngster who is disabled and needs support. 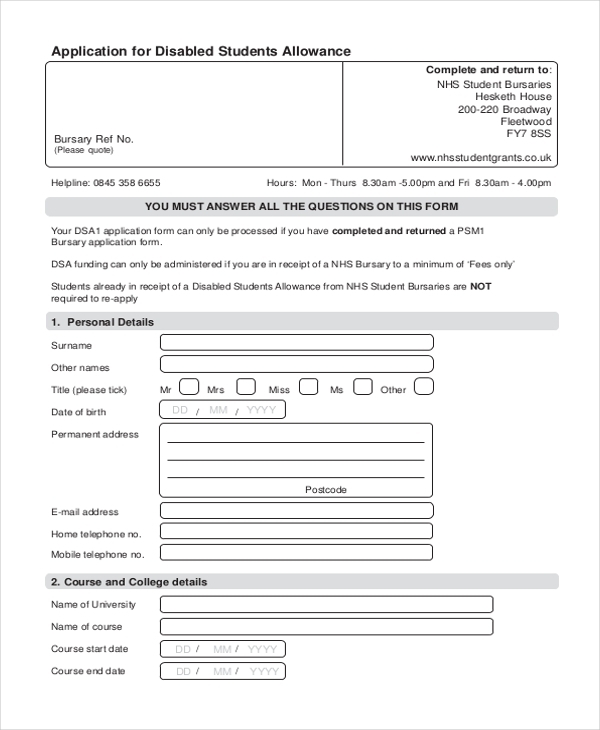 A sample disability allowance application form is a form used to request an individual like an employer, student etc., who has a disability to be considered and given allowance to meet his or her needs. The allowance is given to the individual’s next of kin or the person assigned with the caretaking responsibilities of the disabled person. An employer disability allowance estimate request is a document which is used by employers in situations when they’d like to receive an approximation of the costs which need to be paid towards a disabled employee so that he or she can support his or her caretaking expenses. Prior to making a claim for receiving disability living allowance, it is important to know and well understand who is eligible for receiving the allowance benefits. In this case, many outlets that specialize in paying allowance issues handbooks and booklets. Wherein elaborated information on the same is provided. For people who have a disability, need monetary support to meet their needs, filling and filing a disability allowance form is the wisest thing to do. Receiving such an allowance can prove to be a big bonus for the individual. 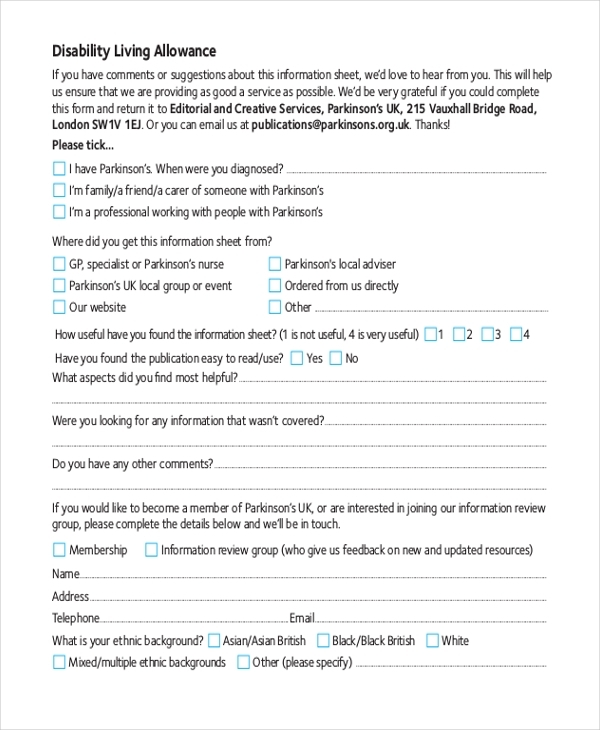 However, the only condition for getting considered is that the disabled person needs to fill up the form with absolutely accurate details and also provide adequate supportive medical documentation. 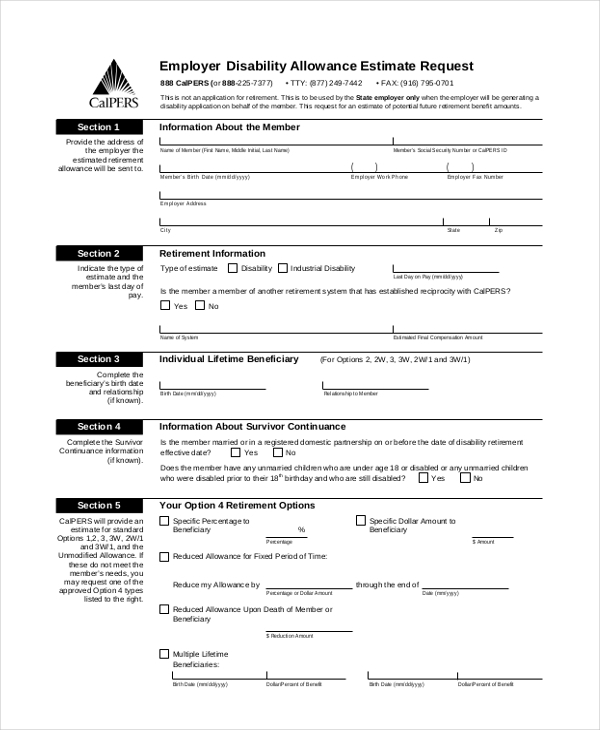 Which gives details about the disability mentioned in the allowance form. You may also see Disability Claim Forms. In case if you’re wondering what a disability form looks like, don’t worry. The Internet has samples and examples available in abundance. The USP is that most samples are ready-made, downloadable, editable and also printable. Users can easily download the form and make changes and redesign the Disability Allowance Application Form to meet the needs of their organization – if at all it is involved in providing non-taxable payments for disabled people. The available formats for these forms are Word, Excel, and PDF. You can also see Disability Application Forms. Disability Allowance Application Form is a big bonus for individuals with special needs. Moreover, the form acts as a mediator and as it is in written form, authorities can easily verify and review the details given in the form before acknowledging and approving to provide allowance benefits. Most importantly, like any other form, Disability Allowance Application Form can be used as recorded proof.